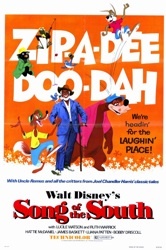 Song of the South has become the cartoona-non-grata of the Walt Disney studios. Although it was once re-released on a regular seven-year schedule with Disney’s other classic animated features, theatrical showings ceased after the 1986 reissue. Although Song of the South was released on VHS and laserdisc, there has never been a legitimate DVD or Blu-Ray release. Disney is concerned that the film would now be seen as racist. This film should not be boycotted because it is racist, it should be boycotted because it is boring. The live-action portions of Song of the South – and that is most of the movie – are directed in a static and stodgy manner. The drama feels staged and obvious, like those old Coronet educational films they used to show in schools. Continuing the trend of other post-war Disney features like Make Mine Music, Fun and Fancy Free, and Melody Time, Song of the South is padded with an endless live-action frame story, which was much cheaper to produce than Disney Studio’s painstakingly hand-drawn animation. We get 17 minutes of excruciatingly slow filler material for every eight or ten minutes of animation. The film literally lurches between animated segments in a set pattern of 17 live-action minutes of the poorly-told Johnny story followed by eight minutes of fun with Br’ers Rabbit, Fox, and Bear. The film is 94 minutes; there are only 25 minutes of animation. FULL DISCLOSURE: The bootleg DVD was faulty. Eight minutes before the end, it began to malfunction. On closer inspection, it seemed the disc was not malfunctioning in my player, but rather the original bootleg copy used by our bootlegger had screwed up, started to skip, and then defaulted to its crude menu. Our bootlegger’s DVD recorder simply recorded all of this, so my disc ends with twenty minutes of the original bootleg’s menu screen. Most of these charlatans only check the first few minutes of the disc; our copy somehow snuck past this infallible quality control regimen. I had to watch the last eight minutes on YouTube. TANGENT: At one point in the film, Johnny’s mother wants him to get all dressed up in a fancy outfit given to him by his aunt. The outfit is very Victorian and colorful with velvet knee-length pants and a lace color. It looks almost exactly like the outfit Django chooses for himself in Django Unchained. We all know Quentin Tarantino is a movie buff. I do not find anything in Song of the South as racist as the crows in Dumbo, and Dumbo has enjoyed multiple releases on VHS, laserdisc, DVD, and Blu-Ray. FULL DISCLOSURE: I am white. I applied to be black; they would not have me. I would think that instead of arousing the ire of the NAACP, the film’s depiction of Br’er Bear would arouse the ire of lobbying groups for the mentally challenged. Clearly, there is “something wrong” with Br’er Bear – not in a “Disney’s beloved Goofy character” way, but in a disturbing “Of Mice and Men’s scary Lenny character” way. When Br’er Bear snarls, “I’m gonna tear yur head clean off,” we know he means it. And speaking of tearing heads “clean off,” re-watching this movie reminded me that Disney family films used to be truly terrifying. 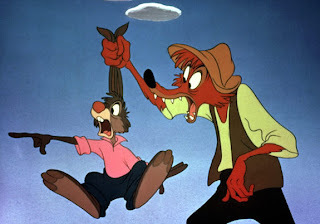 In the animated segments, Br’er Fox sharpens an AXE and says he means to “skin Br’er Rabbit ALIVE.” The two town bullies that torment Johnny are keen on drowning puppies. Johnny’s parents are headed for divorce. This makes me wonder if the working title for Song of the South was The Skinned Alive Headless Drowned Puppy Divorce. You know… for the kiddies. If one looks at the film objectively, another group might also have a problem with it. With its moronic, poor white trash bully boys and controlling, short-sighted, bitchy mother figure, WHITE people might want to boycott this film too. In terms of the film’s plot and the insular, fictitious world it creates, the black characters – while admittedly exaggerated – come across far better than some of the white characters. After all, only white characters in the film talk of divorce and drowning puppies. The cast is a mixed bag. James Baskett is fine as Uncle Remus (he also voices the animated Br’er Fox, the role for which he originally auditioned) and sings the film’s Oscar-winning song “Zip-A-Dee-Do-Da.” Hattie McDaniel basically plays the same character she played in Gone With The Wind eight years earlier. McDaniel won an Oscar for that role, the first black actress to win one, and became so typecast she might as well have changed her name to “Mammy” McDaniel. Ruth Warrick seems to be stuck here portraying the same character she played in Citizen Kane: the controlling, bitchy wife who gets left behind by her husband. Song of the South suggests that if Kane’s wife only had Uncle Remus’s help, Charles Foster Kane would never have started that affair that ruined his political career. Kane would have won the race for Governor and then would have gone on to be elected President. Instead, he died alone and unloved. Kind of makes you appreciate Uncle Remus a little more now, doesn’t it? Song of the South’s biggest legacy besides all that racial rioting (there was no rioting) is the Splash Mountain ride found at every Disney theme park, even the one in Tokyo. According to songofthesouth.net, the only reason Disney’s first flume ride got a Song of the South theme was that ride construction was so long delayed and so over budget that Disney Imagineers simply pulled the Br’er critter audio-animatronic figures from the “America Sings!” attraction next door and re-purposed them for the Splash Mountain ride. Disney seems immensely proud of its theme park ride, and a little guilty about its filmic inspiration. My wife’s brilliant solution to Song of the South’s political incorrectness is to REMAKE IT! The kernels are here for a story that is very socially progressive. Perhaps in the remake, the father’s and grandmother’s social progressivism, which is only hinted at in the original, is made explicit; the mother’s longing for a past that never was is also made more explicit, and we can more clearly see that her latent racism is at the core of every problem in the film. Through the charming interventions of the beloved Uncle Remus, Mother learns the error of her ways. We are the world! The remake could amp up the brotherhood message, tie into Splash Mountain (Disney loves theme park tie-ins) and re-contextualize the original film as a quaint period piece, and then the original could be legitimately released on DVD as a marketing tie-in to the remake. Genius! So there you go, Adam. There’s my take on Song of the South. I would suggest that anyone wishing to view this film should instead fly to Florida and ride Splash Mountain; the ride features all the beloved cartoon characters and songs of the controversial film, but is only nine minutes long. You will get wet. "This film should not be boycotted because it is racist, it should be boycotted because it is boring." And at the risk of a lot of ire, I don't think movies containing these awful stereotypes should be locked away because people should see for themselves that crap like this happened. People should see the "Ridin' to Heaven on a Mule" part of Wonder Bar and have to pick their chin up off the floor. Or hear the "N" word in a movie like Child Bride. So...did we just bring back racism? Damn straight. Also, the WWII outright-racist Bugs Bunny cartoons. And the original Tom & Jerry cartoons with Mammie. In those "Forbidden Hollywood" disc sets TCM puts out, they'll occasionally include some cartoons from the era. At the beginning they have a title card about the awful descriptions of minorities but that they have "historical significance". That might just be a lot of happy horseshit on their part to justify using them...but I believe that. I have a bootleg copy of this as well that looks pretty good. I doubt Disney will ever give a proper release to this movie now, but I agree with the sentiments here that films like this shouldn't be hidden away as if they never existed. It happened. It's real. Once upon a time, this was a night at the movies. To quote Belloq, "We are simply passing through history, but THIS...this IS history." Do as you will, Disney, but we can learn and grow through art. Also, I find Aunt Jemimah Syrup to be delicious. You said it all JB. Great write-up! Growing up, I was convinced that there was a secret garden hidden away somewhere in Critter Country that sold SOTS DVDs; I wasted my childhood searching for it... So I second Adam in thanking you for saving us the trouble of having to track it down to re watch. Now it's back to Lilo and Stitch for me. Random question - If a film like this should be kept from the public, what about Breakfast at Tiffany's and Mickey Rooney's "contribution"? The film is very definitely set in the post-Civil War era. Uncle Remus comes and goes as he pleases, the blacks in the film are sharecroppers, not slaves, etc. The film is based on the stories of Joel Chandler Harris, whose stories actually helped preserve the African American oral tradition despite his being a white author. Although many have attacked his work as theft of their culture, or promoting stereotypes, etc., others, including some African American writers, have defended his work. Indeed he was a racial reconciliationist whose stories, among other things, showed interracial love in a positive light and were criticized in their day for mocking the old aristocracy. Sadly, the increasing simple-mindedness of American culture dictated that the film cannot be seen. Children would still find this film entertaining, if they had the opportunity to see it. The combination of animation and live-action with a primary character who is African-American is significant, more so than an amusement park ride, and the songs are delightful.